If you are an athlete and train to improve your performance, then becoming stronger in functional movement patterns will assist in this endeavour, and is the reason that athletes employ weight training. It doesn’t improve their technique or skill, as these attributes are trained by practicing their chosen discipline itself. However any discipline that would benefit from increased strength or power will benefit from resistance training. Despite the various debates that have ensued over the years about which is more effective to improve performance, machine training or free weights, the overwhelming consensus is that free weights are the most effective means of achieving this. For rank beginners, and older trainees interested in building some muscle, and not primarily focused on athletic performance, machine training can still play a significant role. I trained a lot on machines in the beginning and as far as developing muscle is concerned, they work almost as well as free weights. Machine training is also effective for rehabilitation, and for those who struggle with straight bar work when training with free weights, due to arthritis for example. Nautilus, Universal, Hammer Strength, and a multitude of other machines can all be used effectively to build muscle. They are good for some isolation work, and for beginners – enabling the training of compound movements without requiring the trainee to know the exact form of the movement. I also really like working with pulleys. Despite sharing attributes with both free weights and machines, pulley work can be extremely effective, and should be regarded as free weight work in this writers’ opinion. There are drawbacks to machine training however. Whilst the major muscles are worked sufficiently, the small intrinsic muscles that normally work as stabilisers are not recruited, as the two dimensional movement of the machine makes them redundant. When using free weights, you not only have to control the weight, but also to keep it stabilised. Thus, free weights tend to work accessory, stabilising muscles that machines do not recruit. This is very evident if you stop free weight training for a while, and use machines instead. On return to free weights you may be in for a surprise. The increase of strength as you gradually increase load on the machine over time, is illusory. If you have laid off free weights for a while, then a return to them will soon attest to this fact. There will likely be significant reductions in the weights used, that you were formally able to manage, and definitely not an increase. Unfortunately the increased strength indicated when machine training does not transfer to free weights, or to athletic performance for that matter. You only get stronger in the groove dictated by the machine. I learned this many decades ago whilst using an Incline Bench Press machine. After a month of machine bench work indicating strength increase, my free weight Incline Bench Press actually went down. The neural adaptations and stabiliser strength required for free weights soon returns however. Although there are some acceptable Preacher Bench machines, arm isolation work is also best performed with barbells and dumbells, or on pulleys. Machines designed to train these muscles are generally not very effective. Additionally abdominals, adductors and abductors should not be trained on machines either. Also, many of the machines that purport to work abdominals actually work the hip flexors rather than the abs. When performing machine training, the machine will usually take care of your stability, body position, and range of movement. For rank beginners this means they can concentrate on working the muscle, without having to concentrate on their exercise form. This has some advantages – from a safety point of view you’re not going to drop the bar onto your head. Additionally because the machines tend to control your form to a great degree, it makes them effective for learning movements, at least initially. I still use machine training as an adjunct to free weights. Machines are fast and convenient. 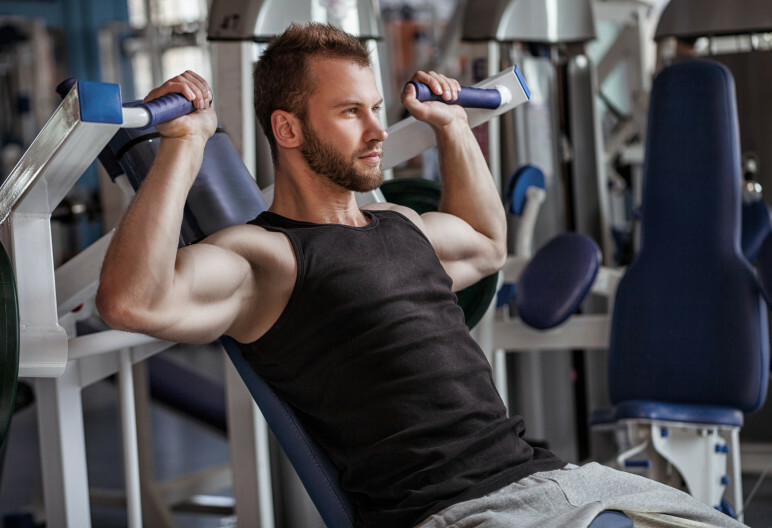 If I am really short on time, I can for example superset Incline Bench Press on the machine with Lat Pulldowns, for a short intense chest and back workout which takes less than ten minutes. Machine training is also effective if you’re attempting to isolate specific muscles, or if you’re using them to help recuperation from an injury. Additionally if you are a rank beginner and haven’t learned how to properly use free weights as yet, or don’t have your form nailed down, the machines can provide a relatively safe means of acheiving this. Additionally if your tired and don’t feel like a particularly intense day at the gym, but desire to workout, you can as an example, instead of doing Weighted Chins, do Pulldowns, with hands supinated if your wish. I am aware that this is not the same exercise, but it works many of the same muscles as Chins. Whilst Pulldowns are inferior to Chins, by allowing myself to do the more easy version some days, I add variety to my workouts, which helps me enjoy training more. In the end, for me, that makes it easier to stay with training. At the end of the day I believe training should be enjoyed and not a chore. Switching things around and using machine training can help alleviate boredom, by introducing more variety. Training can then be more fun and require less self- discipline to complete. Machines have a role in training for hypertrophy. If your goal is functional athleticism however, just make sure that the core of your training remains structured around free weight, compound movements.